December 02, 2018 at 12:50 pm. 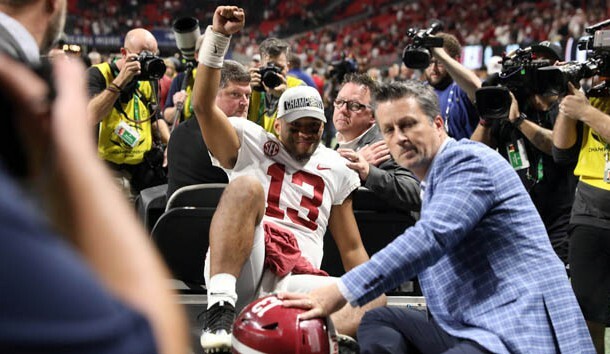 Alabama quarterback Tua Tagovailoa is expected to be available for the College Football Playoff despite spraining his ankle in the SEC Championship Game against Georgia. Crimson Tide head coach Nick Saban said following his team’s 35-38 victory that he didn’t think the injury would keep Tagovailoa out of the postseason. Tagovailoa, who is considered a front runner for the Heisman Trophy, injured his left ankle on sack in the first quarter and his right ankle in the fourth. Jalen Hurts entered the game and led Alabama on a pair of touchdown-scoring drives. The junior would get the nod if Tagovailoa is not ready to play in the semifinal game on Dec. 29. Tagovailoa completed just 10 of 25 passes for 164 yards, one touchdown and two interceptions against the Bulldogs. Hurts was a two-year starter and won an SEC Offensive Player of the Year award before being benched in favor of Tagovailoa this season. He completed 7 of 9 passes for 82 yards and a touchdown versus Georgia and had five carries for 28 yards and a score. “I’ve probably never been more proud of a player than Jalen,” Saban said. “It’s unprecedented to have a guy that won as many games as he won, I think 26 or something, over a two-year period, start as a freshman, only lose a couple of games this whole time that he was the starter, and then all of the sudden he’s not the quarterback.